At that time, there was a strong prejudice in this region of Japan against Christians. The school refused to renew his teaching contract because of his success in his Bible ministry. He lost his income but his sense of calling that he was sent by God to Omi Hachiman never faded. 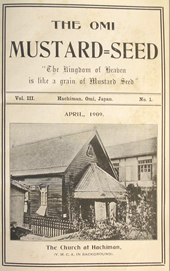 THE OMI MUSTARD SEED had published for American Readers, in the interests of Christianity in the province of Omi which was issued 10 times a year. Vories establishes an architectural office and so shows his abilities to the full. “I was shocked as if my head was knocked by an iron bar,” he wrote after losing his teaching job. He established an architectural office in 1908, and the next year, he established Vories & Co. which designed around 1600 buildings including churches, schools, hotels and private houses. over the next 35 years. Vories forms the Omi Mission and starts evangelical activities with passion. The first publication of monthly magazine “The Voice of the Lakeside”, which was published in July, 1912 as a Christian mission and cultural magazine and it has been circula-ting for the last 90 years. 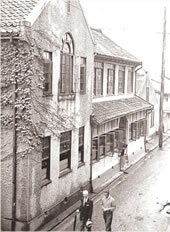 Since many young people were suffering from tuberculosis in Japan, Vories asked for help from his friends in America to build a modern sanatorium. In response to his request, Mary Tucker, who lost her mother to TB, donated the ne-cessary money to build the sanatorium which was named after her mother. Later sanatorium workers got together and formed a group to start a nationwide campaign in the prevention of TB. Through his architectural work, Vories met Makiko Hitotsuyanagi, the daughter of a viscount who had been educated in the United States and recently returned to Japan. Their marriage in June 1919, in the Meiji Gakuin chapel which he had designed, was unusual for its day but led to a partnership that lasted nearly fifty years. Packages of Mentholatum products in the 1920’s. At the beginning finished products were imported, but due to increasing demands, a factory was built in Omihachiman, so self production started. In 1922 Makiko started a day-care center to help working mothers.by providing a model kindergarten for their young children. The Omi Mission becomes the Omi Brotherhood. 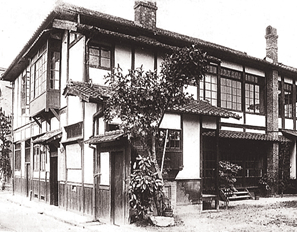 In 1934, the Omi Mission changed its name to the Omi Brotherhood (Omi Kyōdaisha) to show that it was independent, self-supporting, and based on the equal brotherhood of its members, whether they were born in America, Japan, Korea, or elsewhere. After Japan is defeated in 1945,Vories visits S.C.A.P on the Emperor’s behalf. 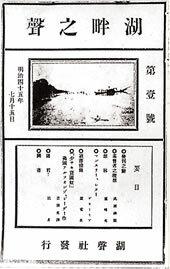 Just before the attack on Pearl Harbor in 1941, Vories naturalized as Japanese subject and took the name Hitotsuyanagi Mereru. He pledged his allegiance to the nation of Japan and to the Emperor. In September 1945,former Prime Minister Konoe Fumimaro asked Vories to convey a message to S.C.A.P concerning the Emperor. Vories also shared the idea of the Emperor renouncing claims of divinity and declaring his humanity. Vories later was able to meet the Emperor four times. When he was in Karuizawa, his second hometown in Japan, in 1957, Vories suffered a stroke and was transported back to Omi Hachiman for medical treatment. Bedridden for se-ven years, he passed away at the age of 83. in May 1964. The following year, 1965, he was honored as the first honorary citizen of Omi Hachiman. 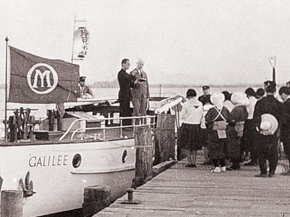 His Imperial Highness Mikasa visited Vories. 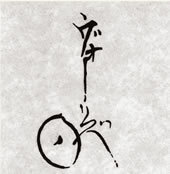 Mr. Vories’ signature, which expresses the ideas of his activities; Omihachiman together with God, is the center of the world.